Enjoy an exciting Match 3 Italian Adventure! After visiting Japan in spring the story takes us to sunny Italy. Help a Young American journalist as she follows the clues given by her friend, French photographer François. Hoping she will meet him at last and enjoy the Italian summer. Choose your own level of challenge. Collect Italian herbs and spices and gather the souvenirs. Play 80 Match 3 levels and enjoy various Minigames. Follow instructions for making pizza, pasta and ice cream. 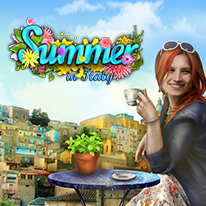 Visit beautiful Italian regions rich in culture and history as you progress in the game.